Making sure that no one on Earth goes hungry is one of humanity’s biggest goals. But with the world’s growing population, this is getting harder. Several studies estimate that the world’s food demand will increase somewhere between 56% and 98% by 2050. One way to deal with this demand is by making more potassium-based fertilizer to help plants grow faster and in areas they wouldn’t normally grow. But currently, making fertilizer involves mining potassium from deep underground and treating it with chemicals that can be harsh on the environment. Then it has to be transported to farms across the world, emitting huge amounts of carbon dioxide. Finding a way to cheaply and cleanly make a lot of fertilizer can help us solve this problem without damaging the environment. The focus of this article and the journal it was published in is a relatively new field, called green chemistry. In green chemistry, we look for ways to adapt current chemical production and research to make it less hazardous to the environment. This new method makes fertilizer production green in two major ways. First, it requires fewer materials and produces less chemical waste than current methods. Second, because this technique is relatively simple and sources potassium locally, the fertilizer can be produced in the same country (or even city) as the farm where it will be used. This greatly reduces the energy and carbon dioxide emissions required to transport potassium (usually mined in Canada or Russia) to manufacturing plants, and then transport the finished fertilizer from the plant to the farm. While current methods use potassium chloride (KCl) as a potassium source, this new method instead uses the mineral K-feldspar (KAlSi3O8) because it is found all over the world. As a major component of granite, K-feldspar can be mined easily on the surface of the earth, so it isn’t as dangerous or expensive as mining deep underground. However, the potassium in K-feldspar doesn’t dissolve in water very quickly, so it can’t be used as a fertilizer by itself; the potassium stays in the mineral instead of becoming available in the soil. 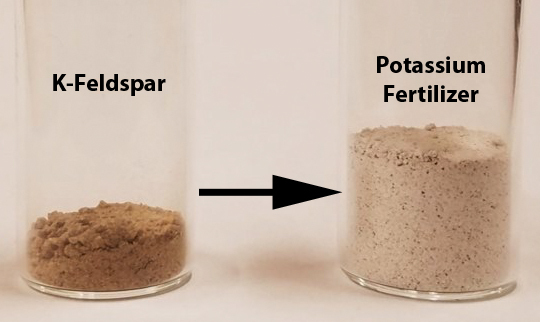 To change this, K-feldspar has to be chemically treated to make the potassium more soluble. The authors used several different methods to determine the chemical composition of the hydrothermal material gathered after the treatment. One of these was electron probe microanalysis (EPMA), which uses an electron beam to scan a material and see what elements it contains. This can give an idea of where certain elements are present in a sample and how concentrated they are. Looking at the finished product, the authors found that the small particles of the hydrothermal material had less potassium and more calcium than would be expected in untreated K-feldspar (Figure 1). The larger particles didn’t change as much, but still showed more potassium on their surface than before they were treated. They also saw a large amount of carbon-containing material that other testing showed were carbonates (compounds with the CO32- anion). Figure 1: Electron probe microanalysis of hydrothermal material particle. “Hotter” colors are higher concentrations of each element in the images. 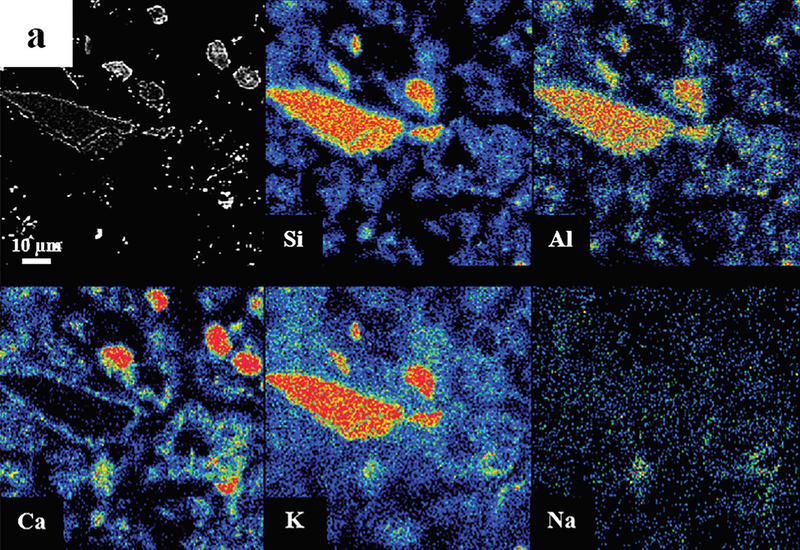 Notice the increase in calcium and decrease in potassium around the edges of the particle (bottom, left two frames). Because of these observations, the authors hypothesized that calcium from calcium hydroxide used in the pressure-cooker treatment was able to dissolve into the smallest K-feldspar particles, replacing the potassium. The potassium then formed potassium carbonate (K2CO3) in the water the mineral was mixed with. Potassium carbonate is much more soluble in water than the potassium in K-feldspar, so it can leach out of the material much easier. The authors tested this by mixing both the untreated K-feldspar and the hydrothermal material with a slightly acidic solution for 24 hours, then measuring the elements that dissolved into solution. 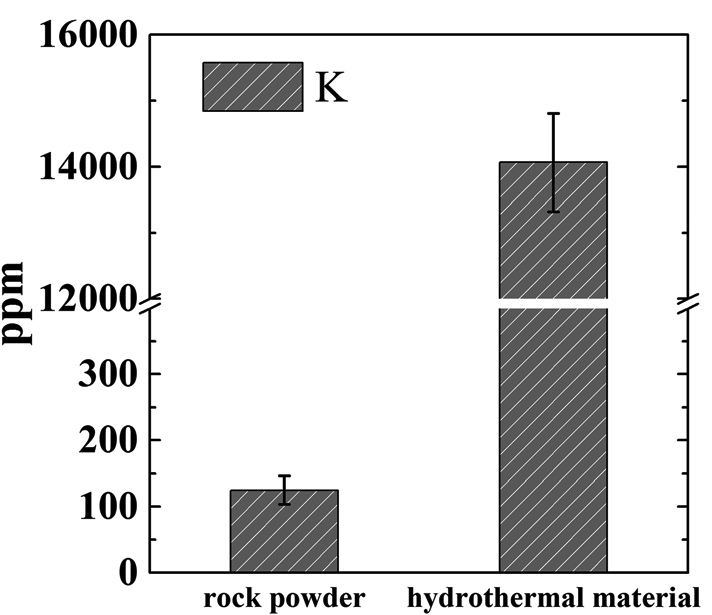 The results confirmed their hypothesis; the hydrothermal material released about 100 times more potassium than the untreated K-feldspar (Figure 2). Figure 2: Concentration of potassium (in parts per million) in solution after leaching for 24 hours. The hydrothermal material released ~100 times more than the untreated K-feldspar. This new method for locally producing fertilizers could provide a low-cost, easily accessible potassium source for farmers. The starting materials are readily available and inexpensive. Since the only material produced (besides evaporated water) is the final usable product, little to no waste has to be dealt with. Supporting low-cost and low-waste agriculture is one of the most important ways to make sure that everyone on Earth can be healthy and well fed.